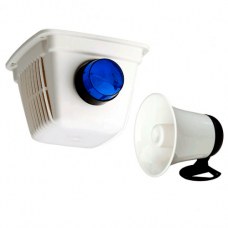 The Hills Reliance External Siren Strobe Kit comes with the external horn siren, strobe, box tamper .. The Hills Reliance Slimline External Siren Strobe Kit comes with the siren, strobe, box tamper all i..
NESS internal screamer flush mount. Operates of 12-volt alarm panel auxiliary ou.. The NESS Quantum Sonic is a movement detector with an inbuilt 106db piezo siren. The sensor provides.. The NESS mini satellite siren strobe is a high-security device that can operate on its own. It has a.. The NESS Security Slimline External Siren Strobe Kit comes with the siren, strobe, box tamper all in..
Internal screamer siren powered by 12-volt auxiliary alarm system output. The siren is designed for&..
NESS External Siren Strobe Kit with 8ohm siren comes with the external horn siren, strobe, box tampe.. The NESS External Siren Strobe Kit K-1000 with 12v relay driven siren comes with the external horn s.. The NESS 8 ohm Siren is a replacement part for NESS, Bosch and Hills external siren box si..